IBC in Amsterdam is mainly focused on the old-school broadcast world. But in between all those large cameras, studio equipment and satellite trucks I’ve found quite a few new mojo products. These are my pics from IBC 2017. Note: I didn’t have the ability to test these products thoroughly. So buy at your own risk. Until now, microphones made for smartphones were mainly produced at that lower end of the market. But that has changed. 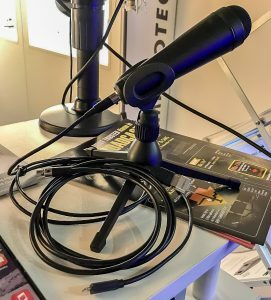 German company Microtech Gefell presented their SRM 100 digital microphone. It’s an omnidirectional dynamic microphone. It comes with a Lightning cable and USB cable (+ converter for Micro USB or USB-C, depending on the phone you have). The sound quality is pretty good, it doesn’t have much handling noise. But the price is pretty high: about 600 euros (and it’s not widely available yet). Downside: there’s no headphone jack on the microphone or cable, so if you have a phone without a headphone jack, you’ll need Bluetooth to monitor your audio. Talking about digital microphones. 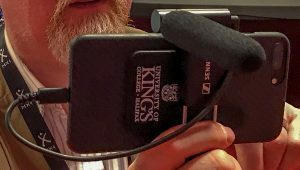 The Sennheiser Handmic Digital – that has been showcased at Mojocon for two years – should be available anytime now. It’s gonna cost around 300 euro, so that’s also pretty high end for an iPhone microphone. Sennheiser also chose to not include a headphone jack for audio monitoring. There is a version with Lightning connector for iPhone and a version with USB connector for Android. Sennheiser also showed the upcoming Focusmic Digital. That’s a small shotgun microphone with Lightning connector. It’s -kind of- a competitor for the Shure MV88. I was able to do some test recordings with mojo guru Glen Mulcahy and we were both pretty impressed with the sound quality, especially the lack of background noise. It’s still a prototype, so things can change, but I expect that this small microphone will be good enough for vloggers and interviews in quiet environments. The Focusmic Digital will cost about 250 euro and should be available in spring next year. Microphone manufacturer Saramonic will be releasing two Lightning audio interfaces. They are upgraded versions of existing analog audio interfaces. 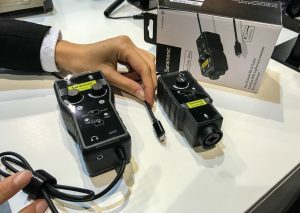 The Smartrig DI (right one on the picture) has 1 XLR input, phantom power, a Lightning output and a headphone jack for monitoring. It’s a direct competitor for the Rode iXLR and the iRig Pro I/O. It should be available in a month and will cost about 108 euros. It has one disadvantage to the Rode iXLR: you can’t plug in a microphone directly, you’ll need an extension cable in between (just as with the iRig Pro). The Smartrig+ DI has two XLR inputs, that can be mixed or separated onto the left and right channel. It’s a competitor of the iRig Pro Duo. Also available in a month. Price: about 180 euros. 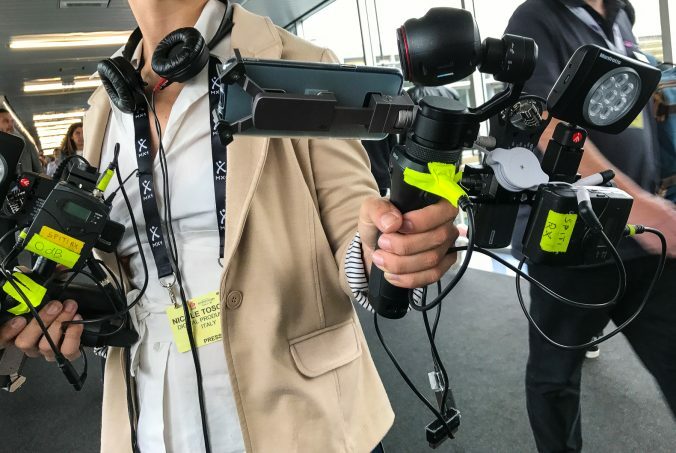 Mobile journalists are still waiting for a truly good wireless microphone solution, ideally without a receiver, using Bluetooth or wifi. The good news is that the people at Shure told me they are working on something like that. In the meantime, of course, you can use a wireless transmitter/receiver that is designed to work with a DSLR or broadcast camera. Another option is the all-new Samson Go Mic Mobile. Samson was not at IBC, but I’ll post a review of the Go Mic Mobile wireless kit soon. 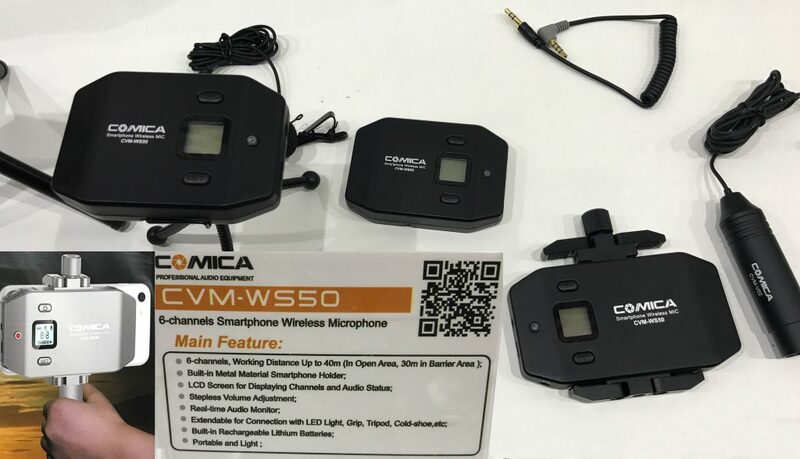 What I did see at IBC was a wireless kit for smartphones from Chinese brand Comica. It’s a UHF system with a 40 meter range and a 3.5 mm output. It’s still a prototype, it should be available in a couple of months. 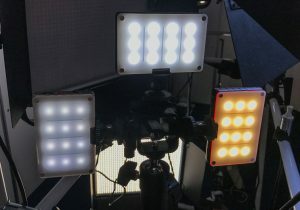 I’d like to travel light, so I prefer a LED light that’s light, but powerful. I’ve seen two interesting ones, both from Chinese brands. I’ve been testing a sample of the Menik STL-9 (left picture, just one unit) for a couple of days now and so far I’m very satisfied. It’s light, has a white diffuser, a yellow filter, a good internal battery (charging via USB), solid buttons and the intensity is adjustable with a small wheel. Price: around 20 euros. It’s not available anywhere online yet. The Commlite Comiray L50 (right picture) looks almost the same. This one is available at various web shops for about 30 euros. 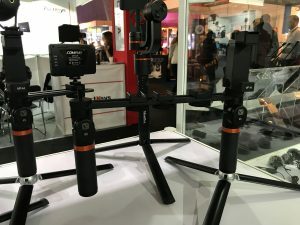 On the same picture: a modular grip system by ViewFlex (not available yet). 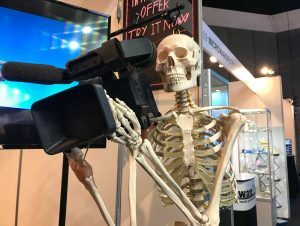 Apart from all these innovations, what surprised me the most at this edition of IBC was the total lack of attention for the whole mojo movement. Of course, IBC is focused at these multi-million dollar companies, it’s not organized for indie filmmakers or individual journalists. But still, it’s so strange that a lot of these big companies try to ignore that there is a huge shift going on in content creation. 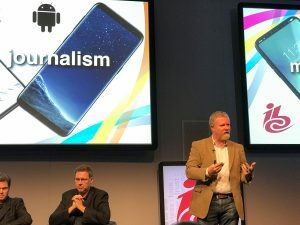 In Glen Mulcahy’s speech, he talked about broadcasters signing their death warrant if they ignore the possibilities of mobile. That’s also true for most of these big companies that exhibit at IBC. I’m curious what’s the difference gonna be when I return to IBC next year.